The silver arrival sale is on and a very special silver giveaway! Hello friends, if you are a fan of beautiful silver, then you will love this post. I never tire of that unmistakable gleam of high quality silver. It is so elegant and adds so much to any space it is used in. I always have a touch of it somewhere in my dining room and living room. I developed this line of silver because I had an increasingly hard time finding beautiful timeless pieces. ITEM 1 The fabulous tabletop scalloped lamps have come back after being sold out the last few months. 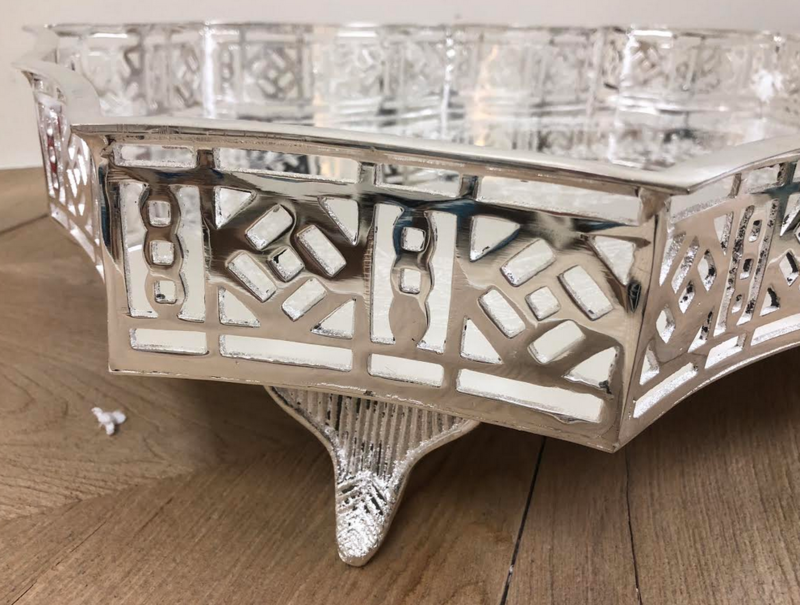 Simply exquisite, finished in a really high quality heavy silver plate with the most beautiful and elegant designs, scalloped and bamboo. Comes with votive that fits right on them with the elegant small beaded shade, they have a really nice weight to them and feel substantial in your hand. Here they are on a recent table I set…..they add SO much to a table! Here is a picture of them in use……cannot wait to host my next dinner party so that I can use them again! ITEM 2. Finally our previously sold out chargers have came back! These are super popular with good reason, they just really elevate any table setting they are used on. Done in a high quality silver, these are very substantial looking. Both measure 14″ wide. 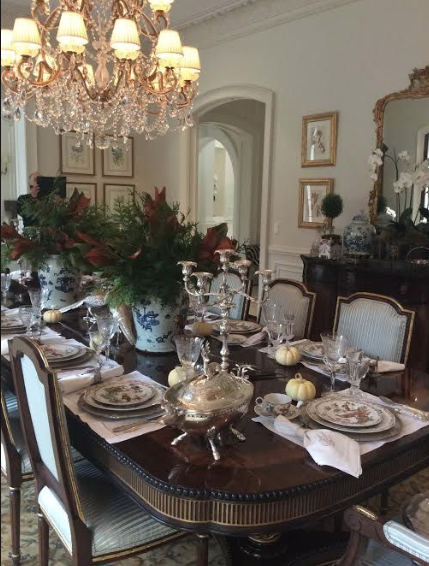 (The square was used above in my Thanksgiving table) and for a more recent white/beige themed table. 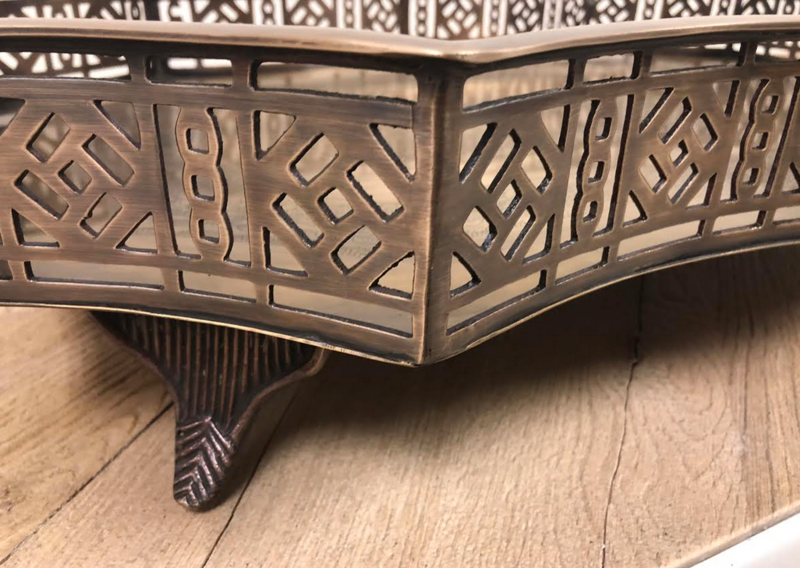 ITEM 3 This fabulous etched large scalloped planter reminds me of the kind of silver you just don’t find anymore. This is as beautiful to use as a planter as it is the most elegant beverage/wine holder. Measures 14.5″ x 11″ x 6.5″ $110.00 for two days! I used this recently as a beverage cooler and generally use it for orchids, it is a regal container for both uses. ITEM 4 These trays you need to see to believe, they are spectacular!! 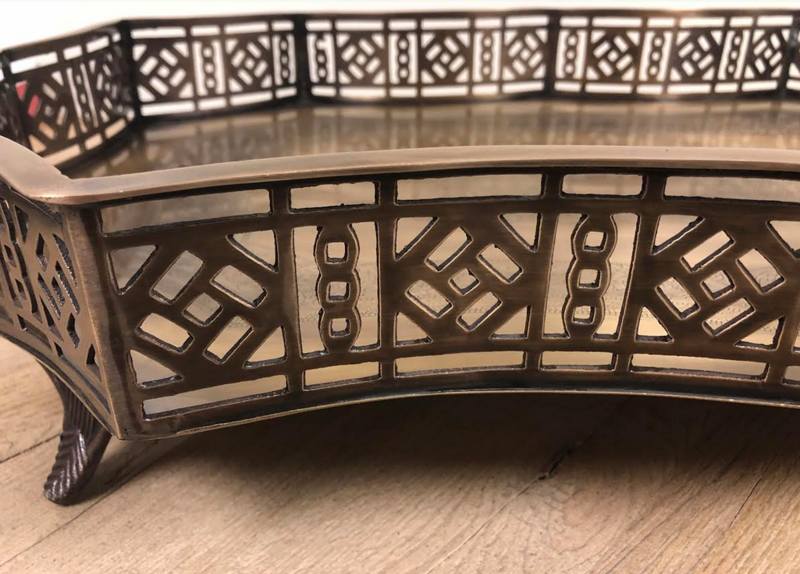 A beautiful and timeless Chippendale design is featured with magnificent etchwork on the face of the tray.This is so fabulous for any kind of entertaining, perfect for placement on a cocktail table or bar. 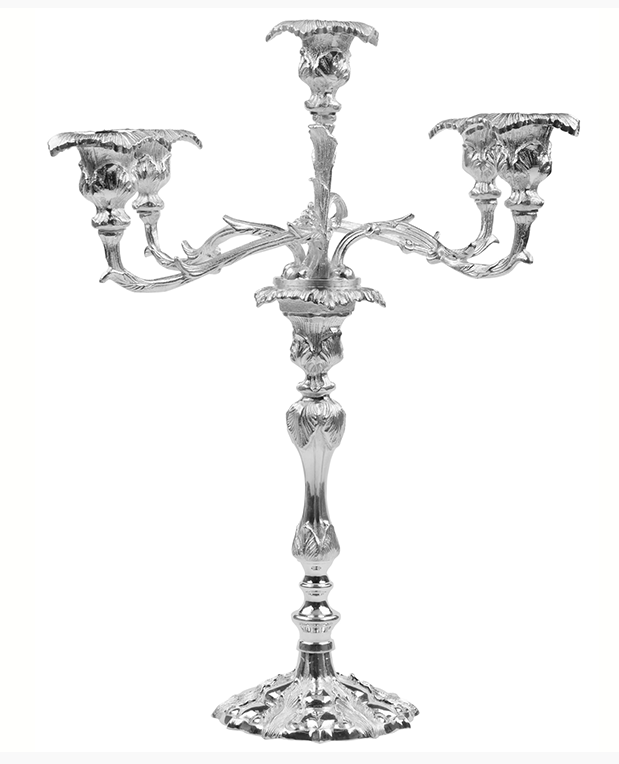 ITEM 5 Our fabulous ornate and highly detailed candelabras are finally back, talk about a most elegant way to dress up a dining room table or console. This is one of my all time favorite items, so love these…you just don’t see things like this anymore which is kind of sad, for traditional classics like this never get old! Here are mine on my own dining table, these are staples and never leave my table. They are simply magnificent! ITEM 6 The popular and super stylish pagoda flatware is here and now in a new great color combination! They are now offered in green for all you green/white lovers! These are so pretty and really unique. Features a stainless steel blade (I recommend handwashing though) Sold by place setting and salad server sets. Green/white. Lots of beautiful things….these things get my heart racing and instantly make me want to entertain:) These will be added online next week sometime, but remember after Friday night, they will be offered at their regular (but still discounted) price. Thanks for stopping by! Until next time…….. Such beautiful pieces! I especially love the tray and have the perfect spot for it. 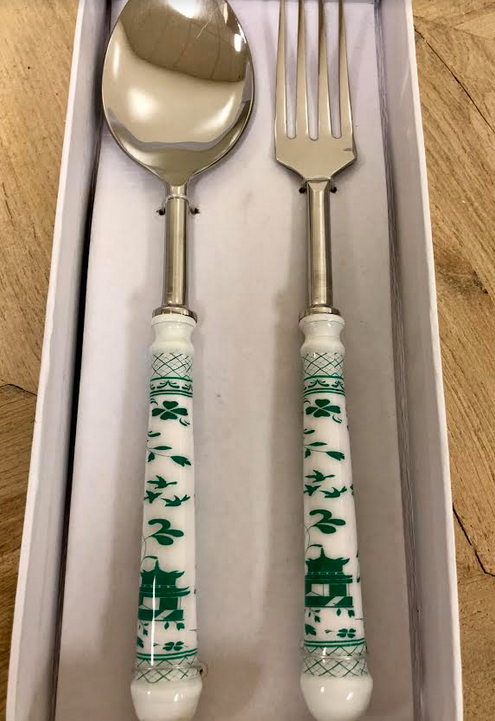 Absolutely love that you have added the pagoda flatware in green! All are beautiful items. My favorite would be the silver trays which could be used so many ways!! OMG love the lamps and the way you have captured all the beauty in the photos. Love your spaces. i love the trays in both antique brass and silver. they have so much details on them. really look so much more expensive then they are. You are so right – it is hard to find nice silver. Once again, so many beautiful items! The trays are at the top of my list. I can think of many places where I might use them. I love my chargers and always get compliments on them. Tina, all is so beautiful, last fall when you had a special offer, I purchased 8 of the square chargers and I love them, used for Christmas dinner and a few holiday dinners I had, and they were such a hit. I love the candelabra’s they might have to be my next purchase. Happy almost weekend. Love all the silver! My favorite is the silver tray. I can always find uses for a tray and to make it silver well that just takes it over the top. Gorgeous! 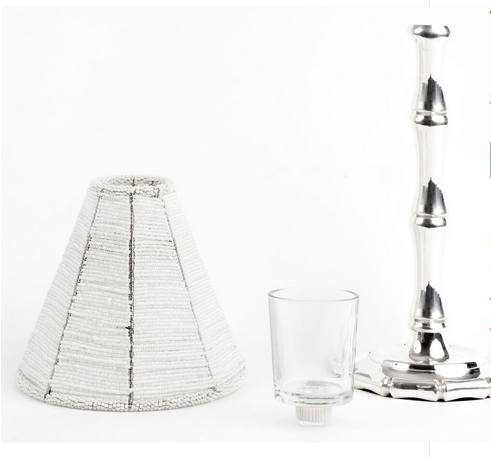 These are some beautiful items and I especially like the little lamps! That planter could be used for many purposes. Thank you for offering a giveaway! The Pagoda flatware…brilliant! Love the chargers Too! I’m in love with ITEM 4! What a gorgeous tray! I can see this going on my buffet or on my bathroom counter with a few crystal items my mother left me. Everything you offer is beautiful! The scalloped planter (Item #3) is so lovely. The multi-purpose planter to be used as a beverage server sounds so elegant or filled with a glorious orchid to make a statement for sure. 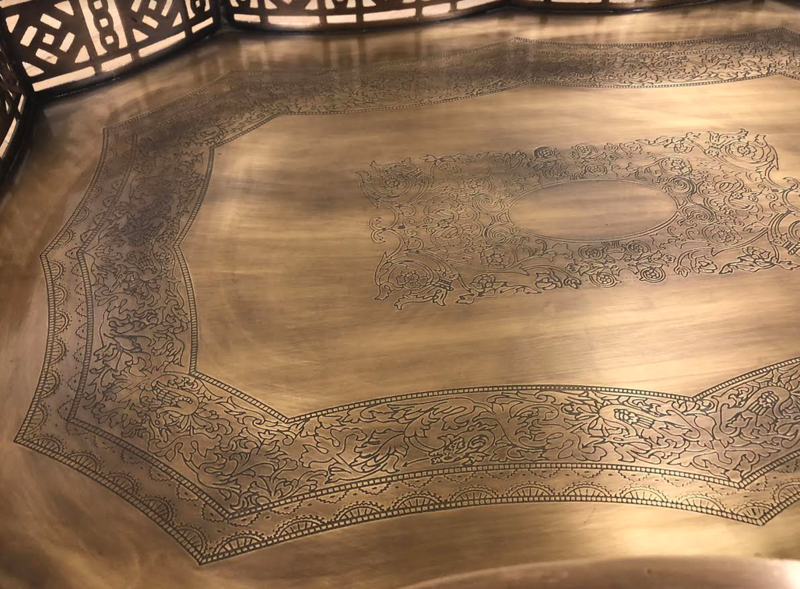 I really love the antique brass tray 👀wow! And the picture of Teddy 🐶what a handsome boy he was. 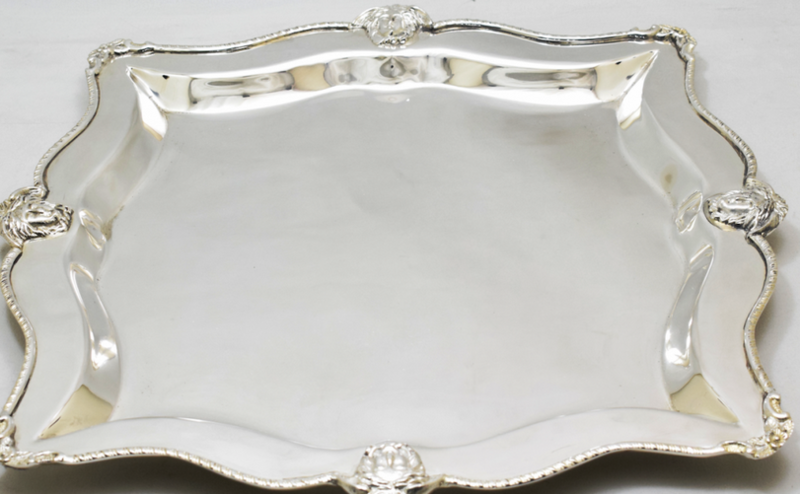 Item #4, the antique silver tray, is my favorite item! Can think of so many different uses for it! Hard to choose from your list but I would love item #3 – does it come in other size ? Ohmy the lamps for votives are absolutely gorgeous and truly a magic spell for the dining table!! The bamboo table lamps are wonderful. Your table scape is fabulous! I love the large planter. Love the large scalloped planter! 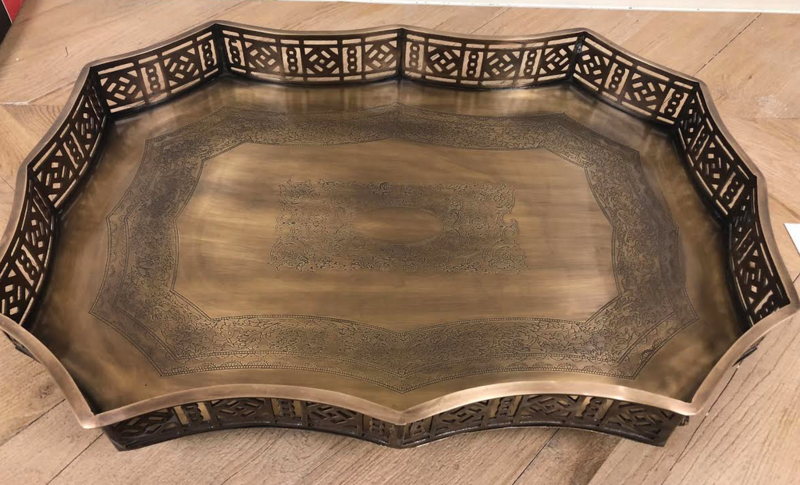 The tray in antique brass – I have been looking for something like this! Definitely my favorite! I love love love the little table lamps! They are just so unique and I can see so many uses for them besides the dining table! I also adore the Chippendale tray. Thank you for bring a little old-fashioned graciousness back into our lives by offering these lovely pieces! Purchased the candelabra last year for my dining room round table! Absolutely love it!!! Recently used it for a royal wedding brunch when Meghan and Harry married. My girlfriends all commented on the gorgeous candelabra. It made the table! You are so right about it becoming harder and harder to find well crafted silver pieces. Congratulations on bringing such beautiful pieces to life! 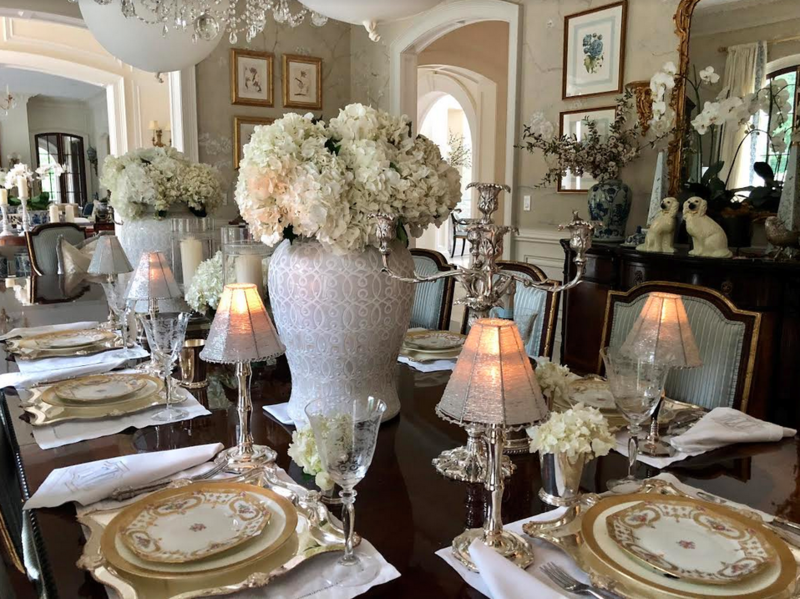 They are all so beautiful, but I am especially intrigued by the scalloped lamps…dining table, entry hall, side tables, guest bedroom…..
Those table lamps are so beautiful and no need to look further – my favorite! Everything else is also beautiful! Tina , you always have stunning photos. I enjoy and look forward to your blog very much. 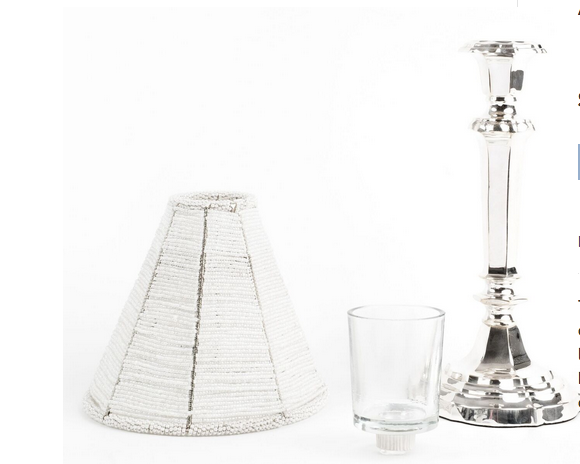 Loving everything but in particular item 3 the silver scalloped planter/ beverage container. Just beautiful! I love the bamboo table lamps. Thinking of using one as a nightlight in my bathroom. Love everything shown but especially the table lamps. Picturing one in my guest powder room! Tina, the small lamps are so charming! Your tables are beautifully set with one at each place. Hi Tina! Wow! Everything in this shipment is gorgeous and elegant. 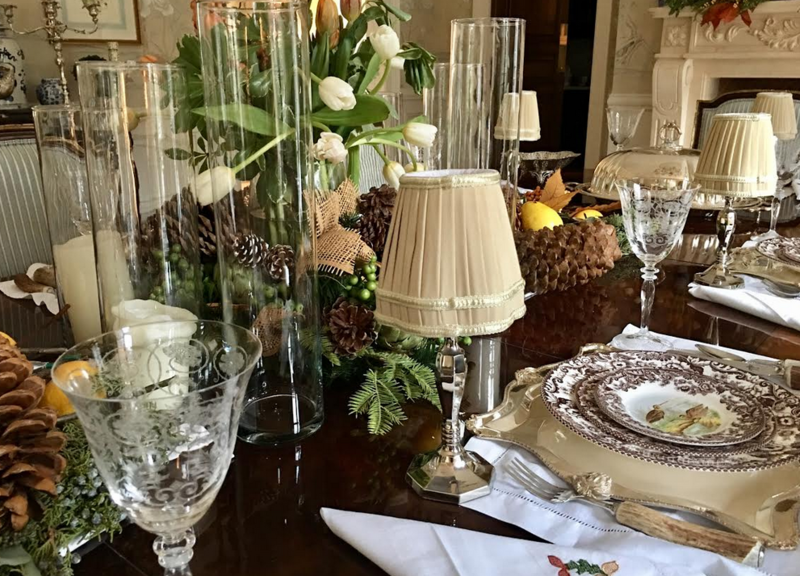 I’m obsessed with the scalloped table lamps, and love how you used them on your table setting. Thanks for continually inspiring! Love the candelabras! So elegant on a beautiful table or sideboard! My favorite piece is item #3 the large etched planter. Pretty and versatile! Love love the antique brass tray. I don’t know if I could pick just one favorite!! This might be the best post yet. If I had to choose the tray or candleabras… still can’t pick just one!! As always, everything is beautiful. I am especially fond of the square scalloped chargers. Their design allows them to be used in so many different ways!!! I just love the tabletop lamps. I have been to the Polo Bar as well and they are A must have! It’s really difficult to choose one favorite item. Everything is so lovely. But the tabletop lamps have always caught my eye. And the silver is breathtaking. 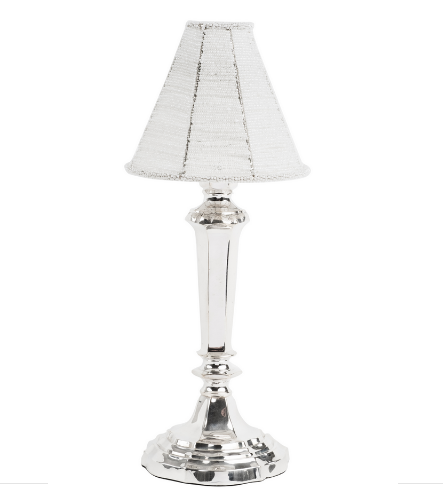 The mini lamps are beautiful, as are the silver chargers. Your table setting is beautiful. 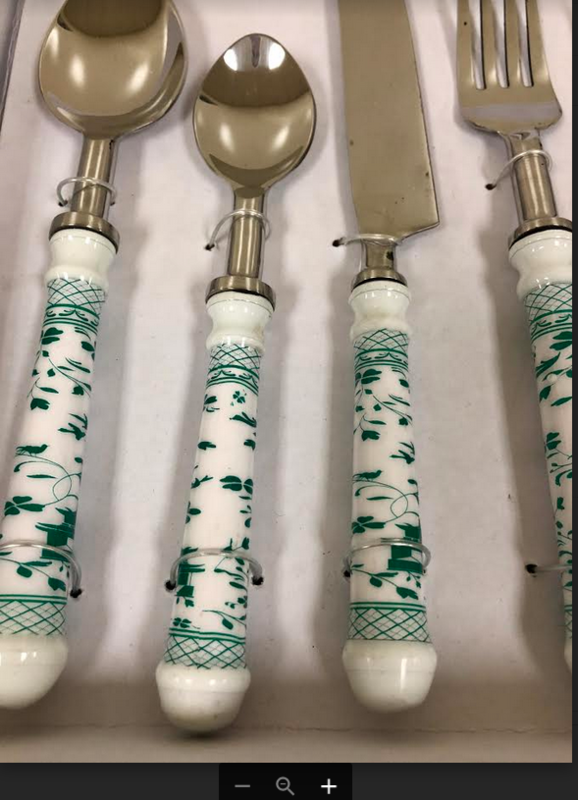 Love the new green & white flatware. Would look fabulous with an alfresco luncheon. THANK YOU. I have admired the Chippendale tray for some time, but the previous one offered was too large for the spot I wanted it for. This new one is the perfect size and can’t wait for it to arrive to dress-up a counter-top in master bath. Today’s my birthday. Hint to husband. My favorite is the Chippendale tray. It is useful and classic. I can see it in my dining room with crystal decanters on it! 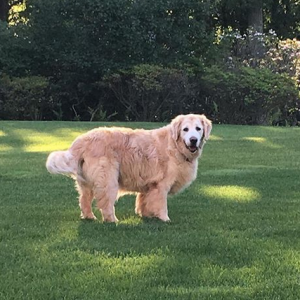 Tina, you will not be surprised to hear (probably many times) that the most beautiful photo in this post is the one of Teddy. 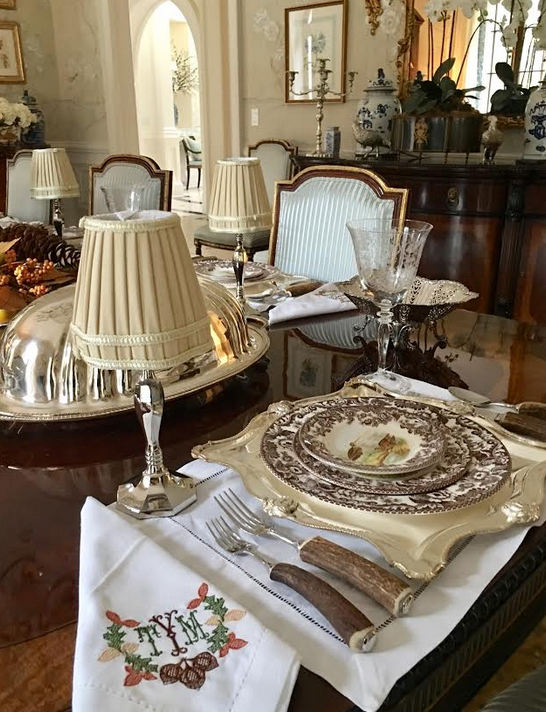 As far as the silver items — it is hard to decide which I like best: the candelabra, the silver gallery tray, or a set of 12 chargers. 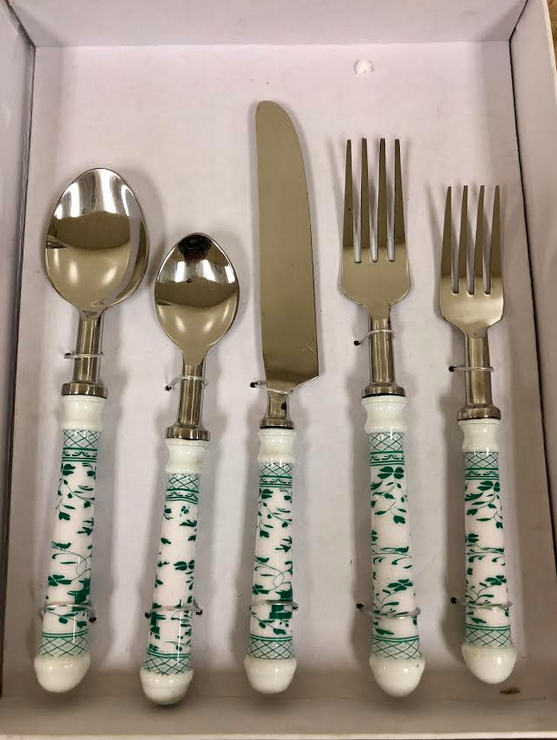 The green flatware is to die for. Always excited to see the new arrivals. Happy summer Tina! Silver, all such fun. Think all the pieces make a statement. Like the lamps. Candelabras very tempting. Love the candelabras and the green and white flat ware! Love the candelabras! They add such elegance to a table. Beautiful silver, Tina! Gorgeous big gallery tray is my favorite! I love the beautiful lamps and your table looks fabulous. All items are beautiful but chargers are so serviceable. I love the silver tray! I’ve had my eye on it all along. I think it would be beautiful in a bathroom as well! Love, love the planter! So versatile! One could use this in any room. 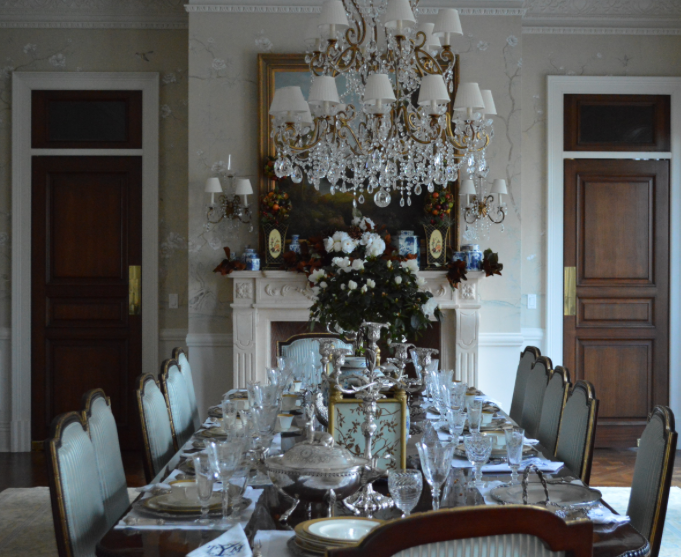 The candelabras and trays are exquisite!! Beautiful silver! My favorite pieces are the lamps with the beaded shades…could us some for my table!! You always have such beautiful accessories for the home. I really enjoy your blog. On my goodness, absolutely love the Bamboo table lamps. I picture at least six of them marching down the middle of my dining table!! Wow, I really can’t choose just one stunning item! 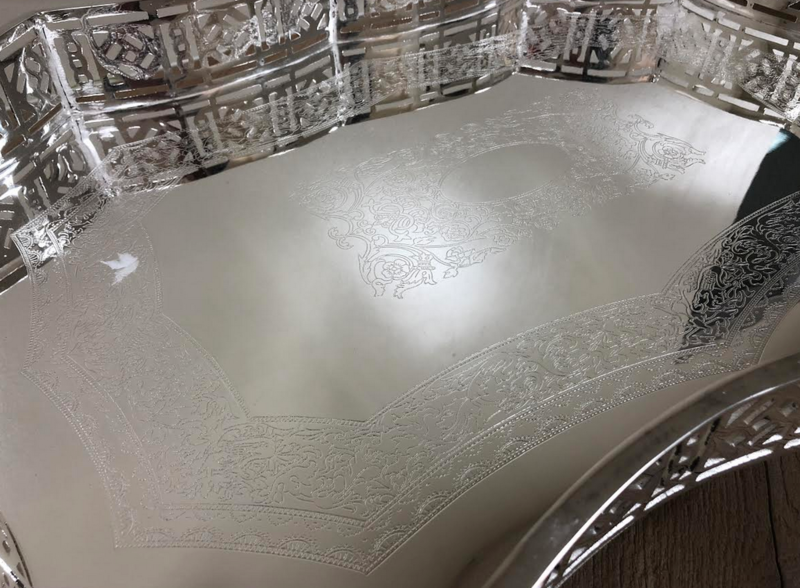 But, the etched large scalloped planter is exceptional! So very beautiful as always! Love love Green and white china flatware !! Love all the beautiful pieces! Especially love the planter/beverage container. Thank you for inspiring us all with so much beauty! The little lamps add so much to the table setting! That extra touch to really set it apart, love it! The planter/beverage container is my favorite. The silver tray is to die for!!! I want!!! I love the chargers… beautiful table Tina! It’s hard to choose only one item. Everything is beautiful. 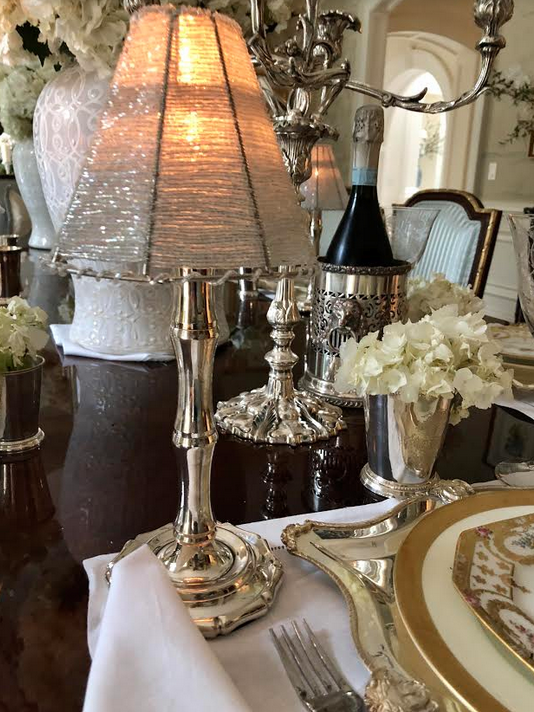 I’ve always loved silver and can vision a beautiful table alternating flowers and the individual tabletop lamps. So unique! I love Number 5, the elegant candlesticks. They make an amazing statement and would be stunning for any occasion. I really love the pierced trays, but everything is so pretty! Hi Tina! I just love the large tray in silver and in brass. It makes a fabulous bar tray to have set up all the time on a buffet. Beautiful and functional all at the same time. Keep the beauties coming. The bamboo table lamps, no wait, the chargers, umm …the gallery tray, oh heck, all of it. 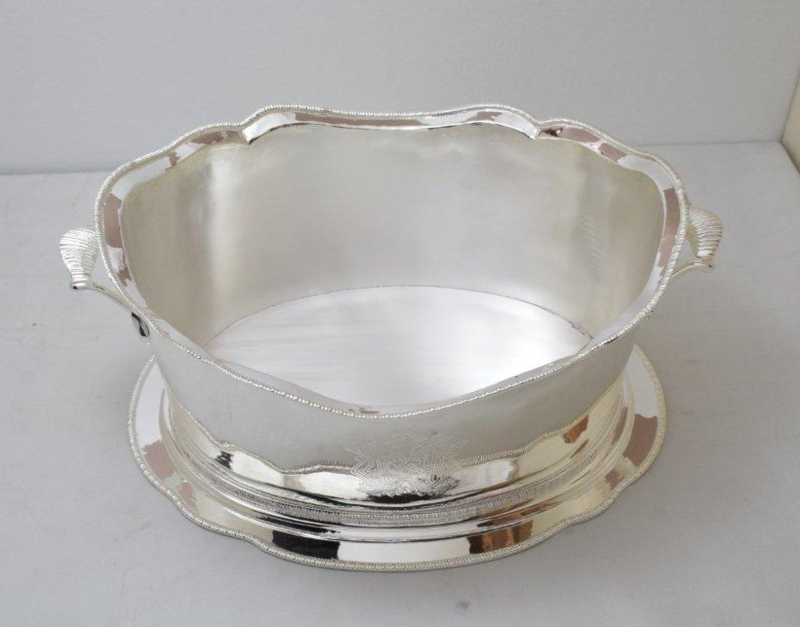 You have exquisite taste and anyone would be proud to use your silver anywhere in their home. Yesterday I received my lovely chinoiserie cream garden seat. Margaret Cherubino was a delight to work with, knowledgeable and customer attentive. My favorite item on today’s post would be the candelabra which would raise any table setting to a new level. Look forward each morning to seeing your blog! 🌸 SILVER! I Love Silver! 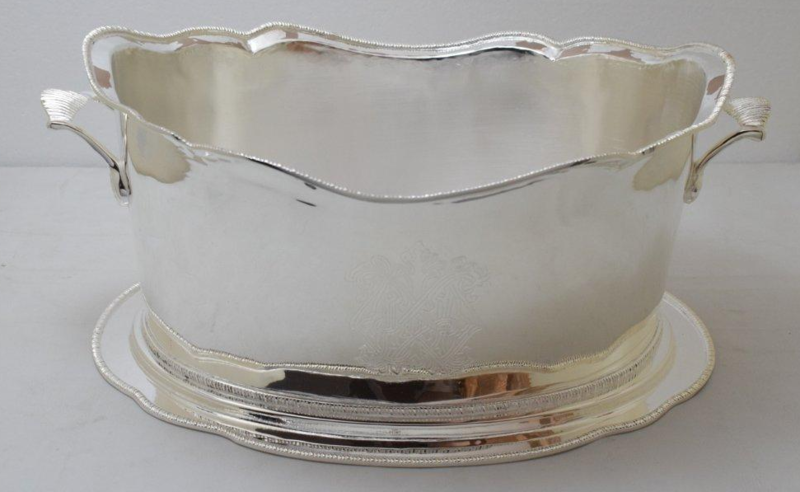 A Silver Tray, Silver Planter, Silver Ice Bucket, Silver Candlestick Holders etc. takes your entertaining to a new level of SOPHISTICATION. The Candelabra and Large Silver Trays are my favourite. BEAUTIFUL! Seeing them all being used gives me Goosebumps! LOVE the scalloped tabletop lamp! Silver is MAGNIFICENT!! Every last piece. CONGRATULATIONS on always showcasing just the right treasures to finish off a room or mood. Everything is beautiful as always! 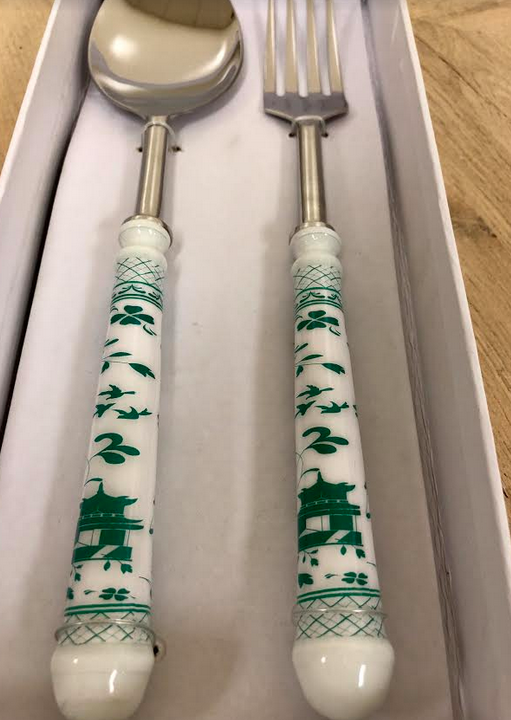 My new fav is the green pagoda flatware. Stunning! The candelabras are exquisite, as are the trays. Wonderful for honoring guests in ones home. As usual everything is gorgeous but my favorite are those tabletop lamps. They make such a beautiful statement on any table. I’d love to have them for the upcoming winter holidays. I love anything silver and that planer will make a beautiful ‘vase’ for my florals! Love the bamboo chargers. Depending on linens & China selections they can look elegant or casual! Your table settings are exquisite and very inspirational. I happen to have everything except the pagoda flatware!!! 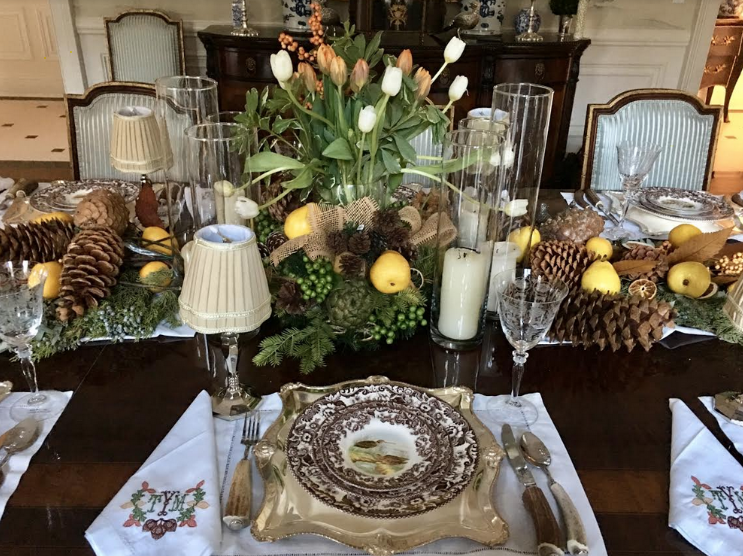 I love it all….and the chargers really dress up a table…I especially like the give-away item…I did not see that in the silver sale…. Love, love, love the scalloped silver chargers!! They look so pretty mixed with the gold trimmed china! Absolutely adore those table lamps. Those candelabras are so exquisite! Oh boy, would I love a set of those. Happy Thursday, Tina! Love the bamboo tabletop lamps! 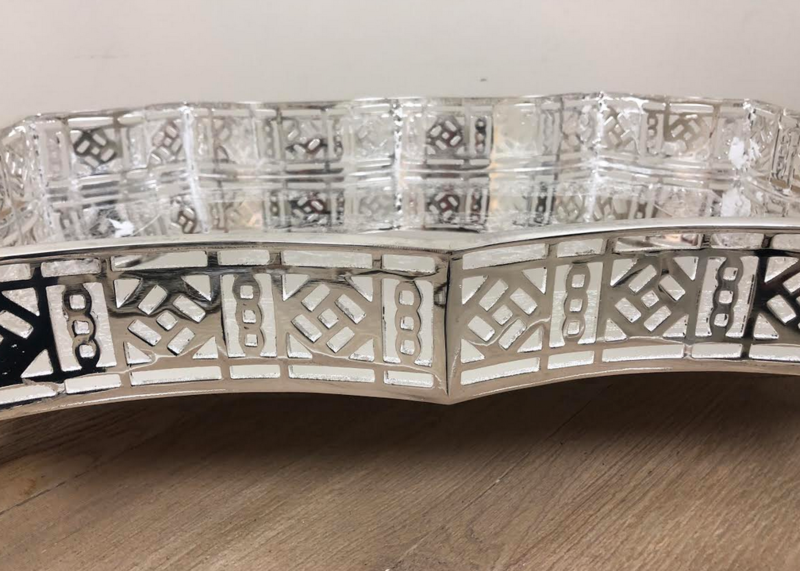 I love, love item #4, this tray in silver is just beautiful! Everything is just beautiful!! But the candelabra is my favorite. I covet it!! 😇 You are so right, Tina, when you say these pieces of silver are becoming extinct. You just can’t find beautiful pieces like you are giving us. Thank you!! All of your silver pieces are gorgeous! My favorite is the candelabra, absolutely lovely! Very elegant! I love any of your silver that is pierced. It is so beautiful! Love the gorgeous silver trays! The silver planter is beautiful! My scslloped lamp looks so perfect on the book shelf in my living room !! I going to order one for my master bath to put on the platform. You set a gorgeous table!! I love these! My favorites are the candelabra and silver planter. Everything is just so lovely, but I especially adore the tabletop lamps. All beautiful, but the Chippendale trays are my favorite! Item #5 is my favorite! They are a dream come true. Love all things silver! Hmmmm, it’s so hard to choose a favorite. The trays might be my favorite because of their versatility, but I love the candelabras, as well. For me it’s all about the bamboo look both of the lamps and the chargers. So stylish on your table and now available to your loyal online friends. Just ordered the mini lamps! Have been waiting for them to come back. Thrilled! Love finding treasures on your site that I enjoy now and pass down to my children. Would LOVE to win. The gorgeous salad server, because of the unique color. I would like to see more of it. 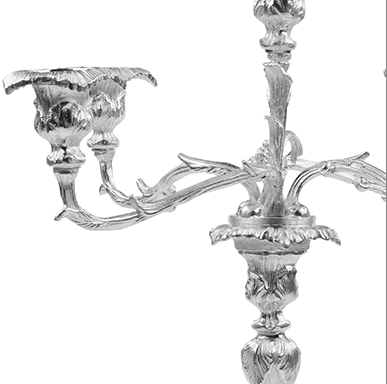 I love the Chippendale tray in silver AND I love love the silver candelabras. I too love silver in the dining room and around my home. Beautiful! Absolutely love #5. Beautiful to leave on table or buffet all the time, and also wonderful for entertaining! 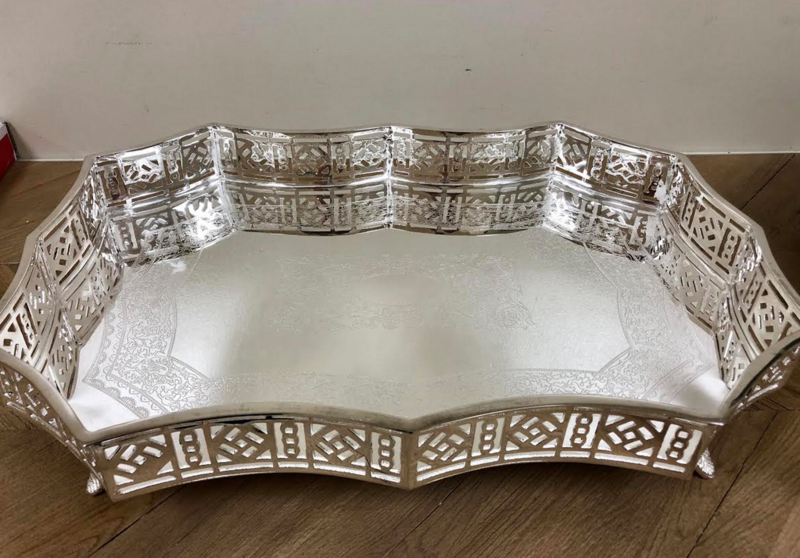 Without a doubt the silver Chippendale tray! So beautiful and would be lovely on buffet surrounded by blue and white jars! My favorite is #5 the large silver candelabra. I would leave it on my buffet all the time and move it to the table for parties. Love to have two of them! Love the chargers. Need to entertain more!!! I love the beautiful candelabras! The candelabra is my favorite piece, with the mini lamps a close second! Will have to drop hints for my birthday! Everything here is beautiful! I especially love your little lamps. I have not seen anything close to them anywhere! I can see why you took that idea and ran with it! My favorite is Item 5, place them on the table, at the entrance on a console, on a sofa table, just right anywhere you put a pair or more!! 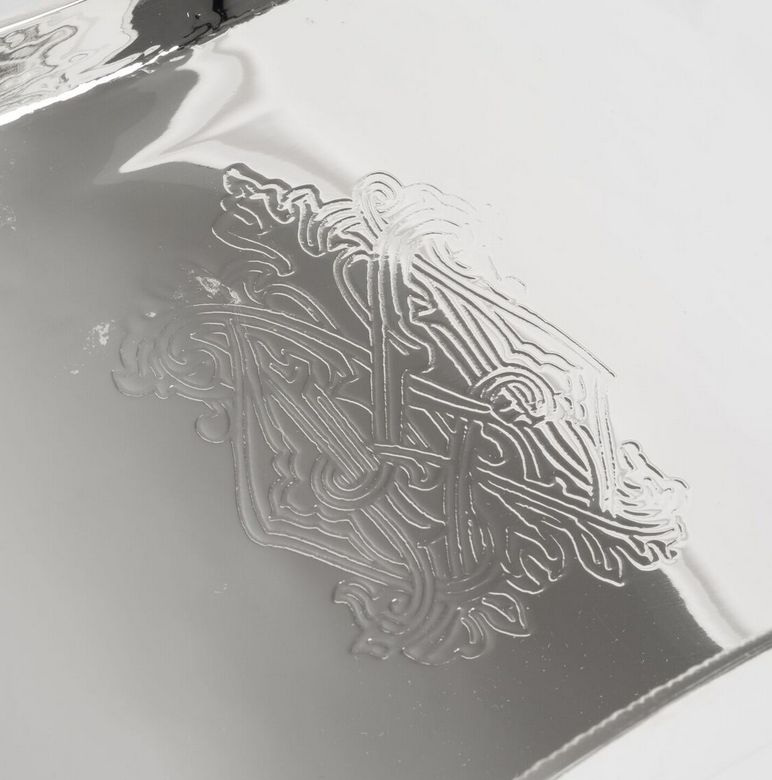 Actually my favorite piece on this page IS the etched planter. It’s the most versatile.. You can use for flowers…live or silk. Flatware. Napkins. Fill with bread for a buffet. The options are endless. I like to get the most use from anything I have. I do love all your things though. I am a big fan of large silver trays for displaying antique books stacked with floral arangements, artwork, candles, etc. They are perfect for elevating anything on a table or ottoman! Yours are ab fab! I love the candelabra. I own them and they are fabulous! Love the scalloped chargers. Beautiful! Love the scalloped tabletop lamps with beaded shades . You are the best! Hard to choose among so many beauties, but the scalloped planter is gorgeously simple, and would be so versatile on a buffet–think warm rolls wrapped in a white, lace-edged napkin. I can’t decide which is my favorite . . . those fabulous chargers or the gorgeous candleabras. They are both dream-worthy! The table top lamps are a must for me! They are truly beautiful and elegant. 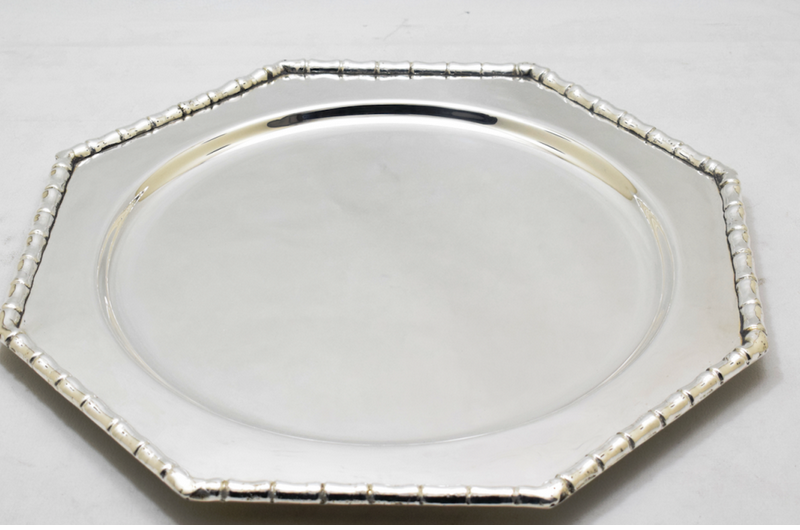 Love the silver tray….so beautiful. Thank you always for making our lives so beautiful Tina! Such elegance! I am in love with your beautiful table settings and want to be a guest at your next dinner party! Celebrating my 39th anniversary on Saturday-what a fabulous gift to be chosen as the lucky winner of the gorgeous silver planter! Keeping my fingers crossed that maybe I will be selected!! I have to say my favorite item is the gorgeous candelabra! It is so elegant and it’s nice to have a piece to add height to a table. 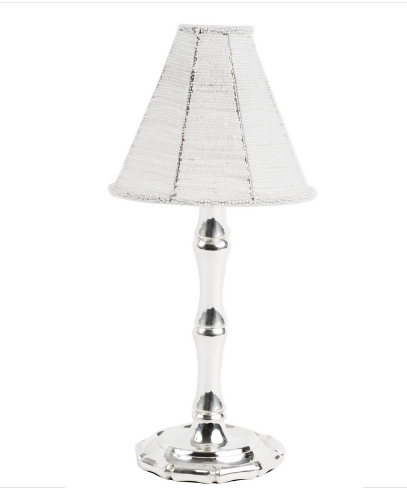 The table lamps are a favorite as well, they are so classic and I’m sure give a beautiful glow. Each piece is better than the last, but I really love the silver tray. I can see it on my kitchen island, with an orchid on it. It would also be nice on my coffee table in the living room. It’s like choosing which child you like best. But if I must, the bamboo lamps are simply gorgeous and would add so much to any dining occasion. Absolutely LOVE the tabletop lamps. Trying to determine how many I might need. The “ant brass” tray is perfect for a personal library, a room where silver would be inappropriate. I can imagine it on my library table, especially for a winter afternoon tea. Oh, it has to be the candelabra! So very elegant, and such a great price point! The tabletop scalloped lamps are my favorite. However, everything is beautiful. Looking forward to decorating for the holidays! A beautiful collection of silver! I absolutely love the bamboo charger. I think the giveaway planter is so pretty as well. What a nice treat to win that! Wow! Another give way! You are too generous Tina. Love the Pagoda Flatware! Such a great color for both the summer and of course the holidays!!! Your table settings are stunning Tina. Just LOVE the individual little lamps. Makes you feel like you’re in a 5 star restaurant. Everything is so lovely but I am head over heels for those trays! The scalloped planter is delightful. Really my favorite of all of the items. I love the detailed candelabras! Beautiful table, Tina! I like item #5. This candelabra is beautiful. I previously purchased the giveaway item and would love to have another. I use it in my bathroom (which is blue and white) to hold guest/fingertip towels. It is the perfect size and adds a little bit of glam! Love, love, love the large scalloped planter! I have so many places I can use this. It is lovely. Love the lamps, the chargers & this planter is so elegant!!! The square chargers are just stunning. While the green and white flatware is nice, I love the blue and white much more. While everything posted is beautiful, my favorite is the give away! Thank you for bringing so many lovely pieces into our lives! The stunning candelabras are breath-taking. What better way to glamorize one’s table for a memorable evening? The green flatware is divine! Green has been a neutral for me for years, and I cannot get enough of it. My windows look out onto a green wooded area and it renews my soul. This flatware reminds me of all the beauty in nature that is green. When we isolate one thing in nature, we gain something lovely like this flatware. Thanks for bringing such an unusual, perfect item to us. Can’t have too many large silver trays! 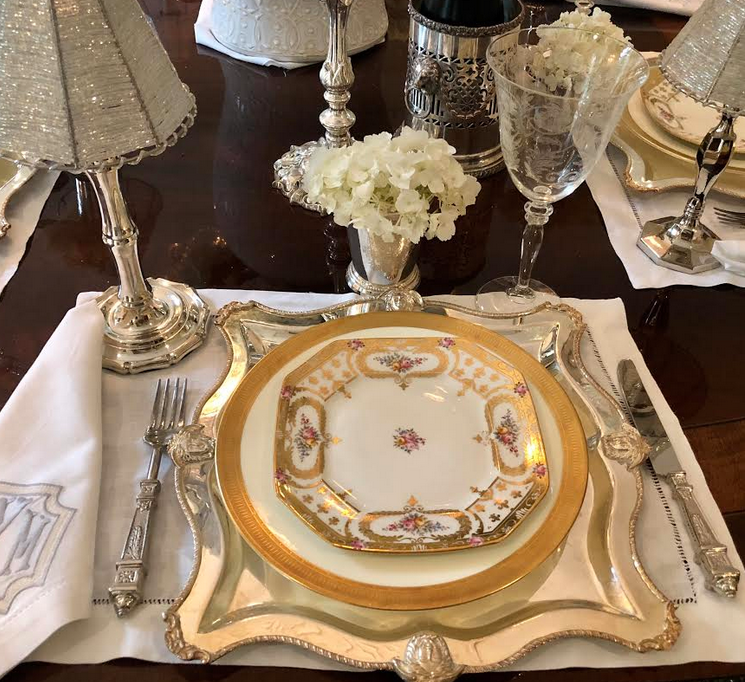 The silver tray is to die for, but I would love to get my daughter who is a new bride, a complete set of the pagoda flatware! I love the chargers. I have the perfect china for the bamboo! The candlelabra are a rare find in today’s market, especially at that price point. Makes such an elegant statement! Would love to see table top lamps in a brass/gold finish. Hope this is a possibility. They are so beautiful! Everything is just beautiful, Love it all so hard to choose. My favorite is the bamboo charger! I’m a candelabra girl all the way and yours are gorgeous! Everything is so beautiful. My favorite is the table top lamps. A nice touch when having a quite dinner with my hubby 💝. The pagoda flatware in green is fabulous and would be great a great addition for a garden party! 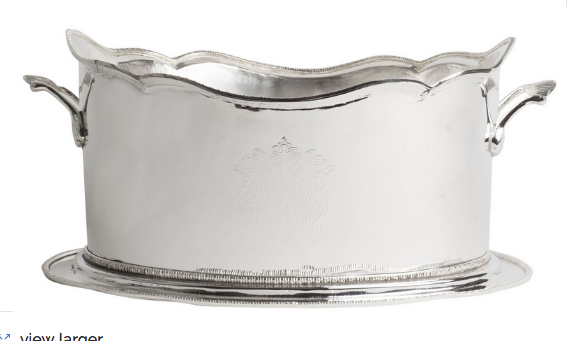 The Chippendale silver tray is also my favorite! The bamboo lamps are amazing. I love all things silver but I especially love the chargers. Those tabletop votive lamps are just so lovely! my favorite item & it was hard to chose- the lamps! I can just imagine my little reading corner lite up by several of these, my feet up, the dog curled up beside me & a good book. I feel calm & relaxed just thinking about it. I am so madly in love with the table lamps! This is what I’m ordering as you can’t find these anywhere! So excited! I would buy everything on this page if I could! Silver is just beautiful. How do I make up my mind? I want all of it! Just love, love all the silver! The small votive lamps are my faves, but – I also love the etched planter! Perfect for your silk orchids I’m coveting! I LOVE the chargers….so elegant! I think the chargers are magnificent. What a way to up the style of the table setting. I adore your cadelabras! Sure hope I win the silver planter! The lamps are my favorite. My favorite is the tray. So hard to chose just one thing!! Love the tabletop lamps, the chargers, and the candelabras!! The candelabras are my favorite! Just gorgeous! These would just make a dinner party table stunning. Thanks Tina, great presale. It’s a hard decision but the silver tray is my favorite . Still in love with the bamboo chargers….sigh! I love your flatware sets. How pretty and what a gorgeous table setting they would make!! I absolutely love the candelabras! Thank you so much for the chance! The lamps are such a special touch! Hi!!! Item #4 absolutely made me swoon!!! In silver!! Stunning!! The possibilities are endless! I live siver, when i eas a little girl my grandmother always made me polish silver with her on Saturdays. I asked her one time why am i always the one who has to polish silverware and she said you want me to give you all this one day?? I thought to myself and said aloud why would i use it. 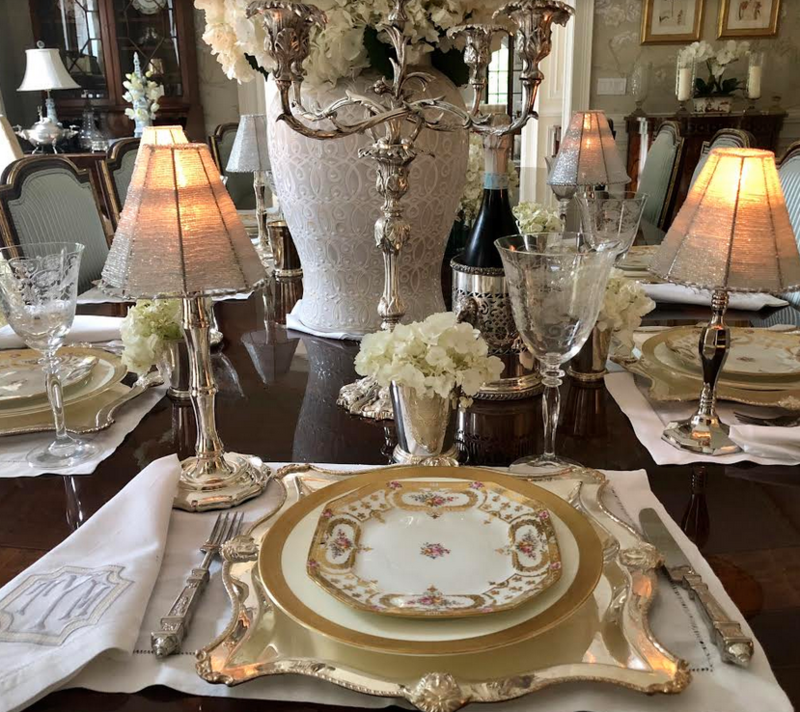 She laughed and said oh honey, there is nothing like a beautiful tabel setting with polished silver. . She had 4 daughters snd 6 grandaughters and you know she left every piece th to me. Ss an afult women she was right. Then my fisnce let 2 people stay at our house while i was buring my grandfathers ashes in another state. I eas devastated when they stole it all. Th this silver eas my great grandparents and dome pieces were given to my grandparents on their wedding day. Table lamps were my favorite item, They truly elevate the table to a whole new level! 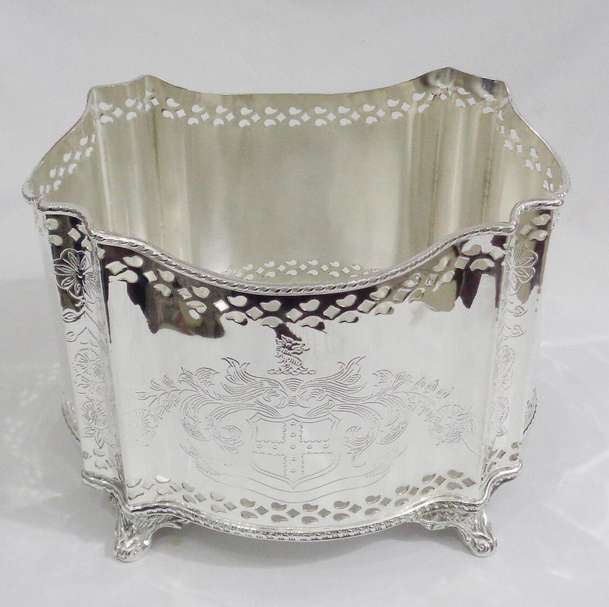 Definitely the Fabulous Etched Large Scalloped Planter…..It’s a multitasker!! I just saw this on Pinterest today 12/14/18. I love the square chargers and wonder if they are still available for sale. All of your items are beautiful!! Beautiful tables and decor. I grew up with tables settings like these. 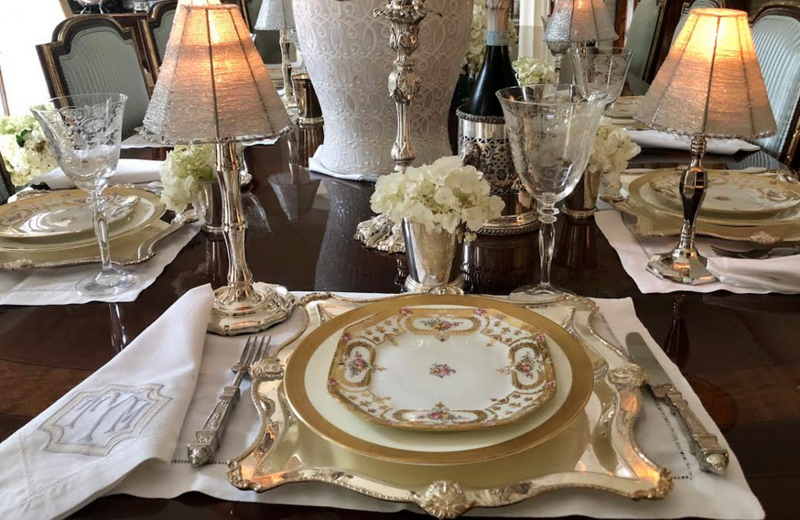 As a wife of a diplomat I spent 40 years giving dinner parties with beautiful silver, china, and linens. Nowadays it all seems outdated and my grown children and today’s generation want no part of it. All white and simple. It hurts to know no one will care for these beautiful items. If you know where I can have some silver replated please let me know. Or where we can sell Wedgewood china, Christofle silverware etc.